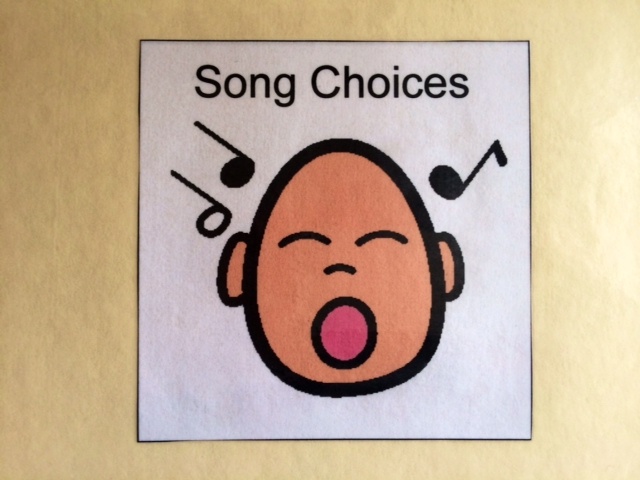 I recently created a song choice board for a client who loves children’s songs…and have found myself using it with almost all of my little ones these past few weeks! I love that it’s portable, promotes decision making and can be a great way to increase client flexibility and range of musical expression. When I use it, I encourage clients to select one song and one instrument to play and have them move the icons to strip with an “I want” icon. Then, I read the sentence out loud, (i.e., “I want to sing ‘Twinkle Twinkle’ with the guitar”). The great thing about making a visual like this is that you can really tailor it to your needs. 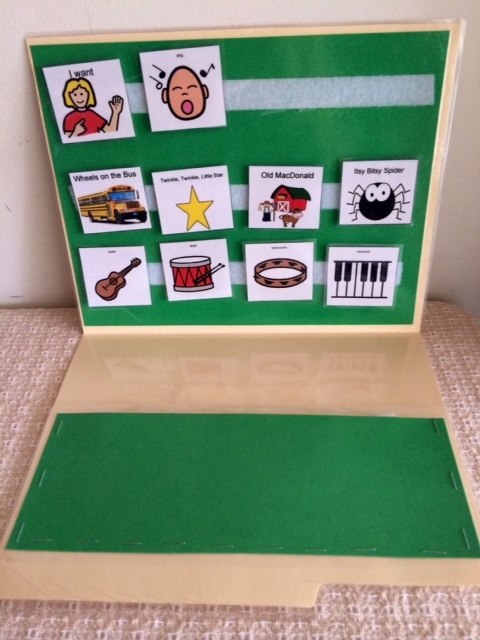 You can make icons for client preferred instruments, different ways to sing a song (loud, soft, silly voice, etc), and for the range of songs that you frequently use in your therapy sessions. I constantly rotate icons in and out of the choice board (the pocket is great for hiding songs that clients may perseverate on, especially if you’re attempting to introduce a new song or activity!) and even have icons for some of my original songs. This would also work great for teachers who want to encourage choice-making in the classroom during circle time! To learn how to laminate a file folder, check out this tutorial on the blog Sunny Days in Second Grade. Create instrument and song icons as needed. Once your folder and icons are laminated, add some velcro strips to one half of the folder and staple or tape a pocket on the other end. I also put an icon on the front of the folder so I can easily pick it out from my other visuals. BE THE FIRST to hear about new posts, free downloads and session plan ideas from Songs for Success by entering your e-mail in the sign-up box on the right and following my twitter or pinterest. ← LOTS of Resources + Exciting Things Ahead!